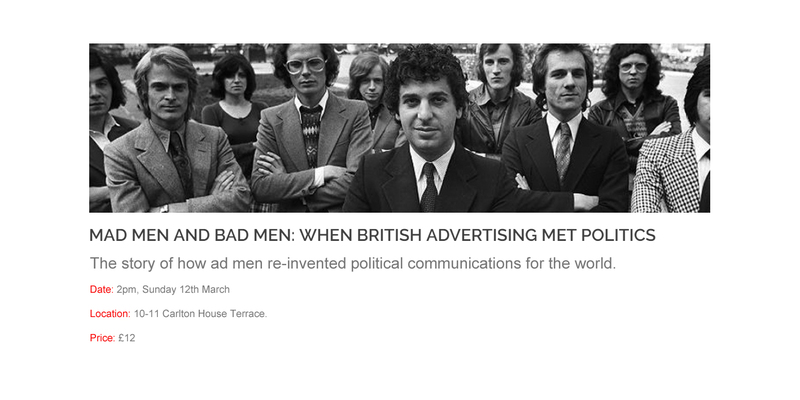 Sam Delaney, author of the seminal book ‘Mad Men And Bad Men: when British advertising met politics’, is hosting a panel event on Sunday 12th March featuring a group of people who have defined political advertising as a discipline: Bill Muirhead, Jeremy Sinclair CBE, Lord Tebbit and Shaun Woodward (tickets available here). Bill Muirhead & Jeremy Sinclair CBE, Executive Director and Chairman of M&C Saatchi respectively, were both intimately involved in the Conservative Party’s successful campaign to win a majority at general election 2015. I suspect they would have been two of a small handful of people who conceived, sold and delivered the defining image of the 2015 campaign (and I would argue the best political advertisement for a generation). Given the number of elections they’ve worked on, it wouldn’t surprise me if they have considered every single one of the ways to execute the only two strategies in existence: it’s time for a change, or, it’s not time for a change. Lord Norman Tebbit was a towering figure in the Conservative general election campaigns of 1983 and 1987. Lord Tebbit was only second to Margaret Thatcher in terms of Conservative Party appearances on radio and television news broadcasts during the 1983 campaign with 81 appearances (Thatcher made 331). And in 1987 Tebbit – amongst other roles – was the ‘client’ for Saatchi & Saatchi. He is credited with insisting on a relentless focus on the economy and defence, bought some incredibly memorable advertising and spearheaded a third successive general election victory for the Conservatives. Shaun Woodward was an MP from 1997 – 2015 and was responsible for coordinating the Labour Party’s 2001 general election campaign. I would argue the 2001 campaign saw the peak of the Labour Party’s creative advertising output, with the infamous ‘be afraid’ poster being the overall highlight. They’re all getting together, as part of a series of events celebrating the centenary of the Institute of Practitioners in Advertising, to discuss what happens when AdLand and Westminster collide and you’d be a fool to miss it.